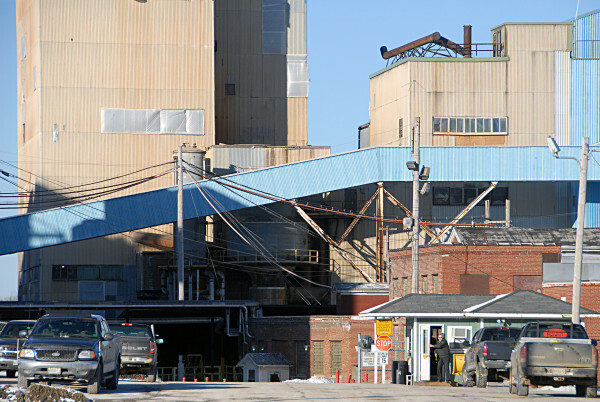 PORTLAND, Maine — The group of asset liquidators who bought equipment at the shuttered Lincoln Paper and Tissue mill have acquired the bankrupt company’s trademarks, patents and other intellectual property for $75,000. A bankruptcy judge in Portland cleared the sale from the estate of the bankrupt Lincoln Paper and Tissue LLC during a hearing Friday morning. A group of more than 50 former employees had objected to the move as a last-ditch effort to keep papermaking capacity in Lincoln. That’s because the intellectual property sale clears the way for the mill buyers to sell off papermaking equipment that uses patented methods, specific product recipes or proprietary software, including its Tissue Machine No. 8. The consortium of liquidators led by the Boston-based Gordon Bros. said during a hearing in late February that they have already sold the tissue machine, but they did not disclose the buyer. In objections to the intellectual property sale, former employees identified the buyer as the Canadian Kruger Paper, which had submitted a bid on specific equipment during the bankruptcy auction for the mill. The former employees wrote that they were worried the sale of the mill’s intellectual property to a company such as Kruger would mean a certain end to papermaking there. Those objectors had asked for more time in order to allow them to put together investors to make a counteroffer on some of the equipment to Gordon Bros. The court delayed a ruling on the sale motion and set a deadline of March 15 for further objections. None were submitted by that time. Former employees who objected to an expedited review of the intellectual property sale in February did not identify the potential investor, but all used similar language in describing the possibility. “I understand there is a group of investors who have a business plan and are putting together financing to purchase and operate the Lincoln Mill intact,” the Rev. Jack Stewart wrote. Jay Gellar, the attorney representing unsecured creditors in the case, said in late February that he spoke with a Joe Nugent, who he said was working on an investment proposal to buy the mill. A man by the name Joe Nugent III started a Facebook page titled “Help Save Maine Manufacturing / Jobs” in November, but did not respond to a request for comment. Nobody by that name had filed any objection to the intellectual property sale in the case. The sale includes the Lincoln mill’s trademarks, copyrights, trade secrets, software, inventions, web addresses, product recipes, customers lists, past sales information and other business information. The sale does not include the name “Lincoln Paper and Tissue” or web domain lpt.com, the company’s corporate books, meeting minutes or accounting and finance information.